My wife and I have season tickets to the Seattle Sounders, our local Major League Soccer Team. This allows us to not only enjoy the fun, entertainment and energy of the sixteen or so matches that we get to attend each season, but also allows us to immerse ourselves in the pre-game festivities in Seattle’s SoDo neighborhood. Given that the area is home to both Centurylink Field (Seahawks and Sounders) AND Safeco Field (The Mariners), there are many wonderful destinations for game day sustenance, of both the solid and liquid variety. 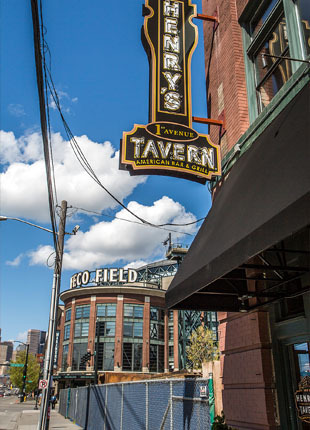 This past Sunday, the missus and I set out for Henry’s Tavern, which recently opened on the corner of 1st and Edgar Martinez, just across from the entrance to Safeco. The Seattle location is the third in a chain (other locations in Oregon and Texas) of full bars, and boasts 100 beers on tap. While the sheer volume of the list is impressive, there was little on it that I had not already tried. Of course, this fact in no way precluded me from enjoying the hell out of the available drafts, as I indulged in the hoppy goodness of a Ninkasi Tricerahops, followed by the smooth and nutty Two Beers Brewing SODO Brown. There was plenty to satisfy the less hop-acclimated palate of my wife as well, and she was happy to find a good list of lighter-bodied beers, including her choices: Alaskan Summer Ale, and Leinenkugel’s Summer Shandy. As we continued to peruse the beer list, we also indulged in Henry’s game day menu, which is a truncated menu of – what I assume are – the items that are quicker and easier to push out of the kitchen. While the wife kept it marginally lighter by ordering a grilled chicken and avocado “artisan sandwich”, I decided to tuck into the 3 Napkin Haystack BBQ Burger. It lived up to it’s name. The chicken sandwich was well-cooked, moist inside, and was topped with a nice ripe avocado and a tasty slathering of aioli. 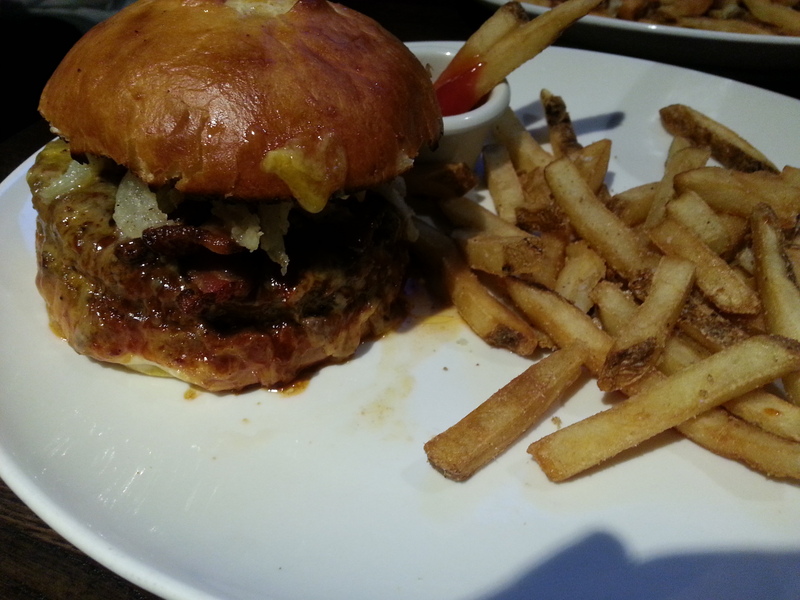 The burger came out perfectly medium, and lived up to its moniker. The patty was crowned with a layer of Gooey Tillamook cheese, crispy onions, a thick layer of house BBQ sauce, and some of the tastiest applewood smoked bacon that I’ve had recently, all packed into a perfect – crispy outside, soft and tasty inside – artisan bun. I love food and beer, obviously. Henry’s did a great job at not only providing a (large) variety for us to choose from in BOTH of those categories, but it also did so in an efficient and – infinitely more important – incredibly satisfying manner. 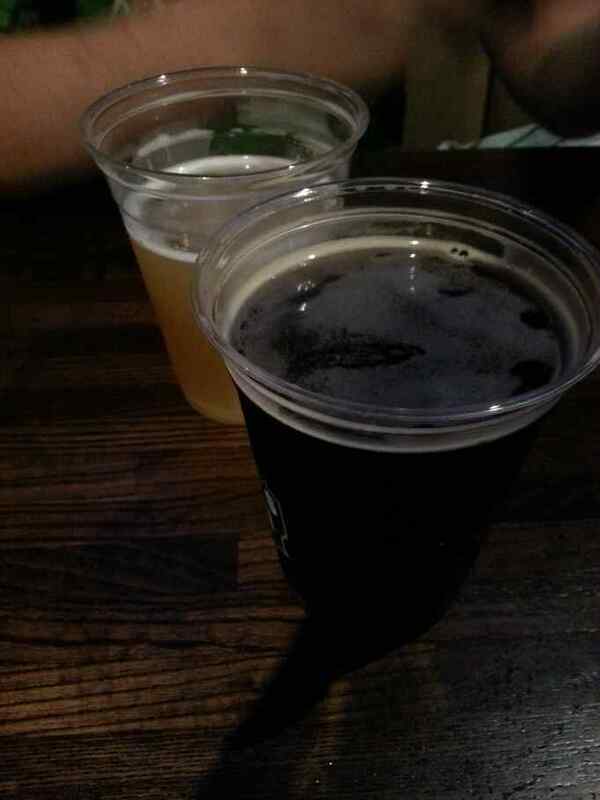 After all, that’s what you want before a match: good beer, good food, good company, and a good place to enjoy them.